Embossing is the process of generating a raised relief image or design onto paper or other materials (known as substrates) such as cardboard, leather, plastic and others. The pressing raises the chosen surface giving it a new dimension. The process of embossing is a very elegant one, it affects the nature of the material being embossed by elevating its standard and quality. It adds a level of beauty that may have not been originally present. Our embossing process begins with cutting-edge pressing machinery and ends with business cards that are pressed to perfection. We are capable of creating the most precise of raised patterns – from faux wood, to intricately detailed wallpaper. 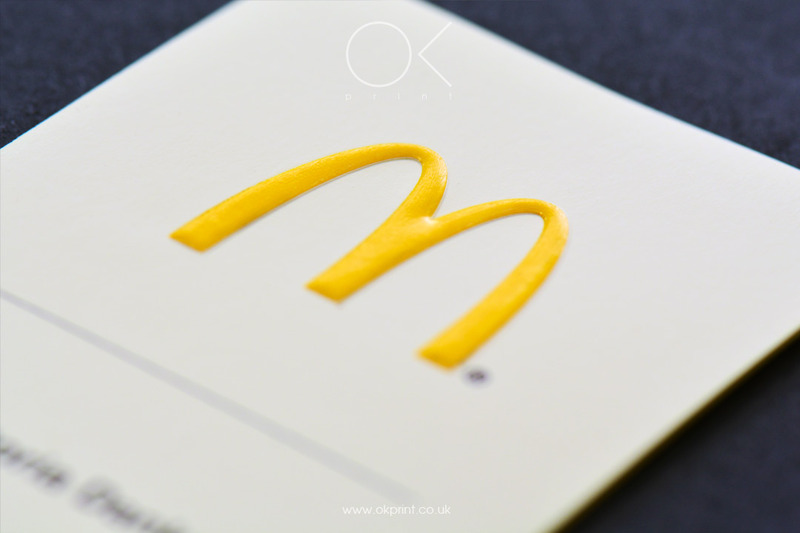 We can work with an array of differing materials, including the traditional – such as card, as well as materials that stand out and away from the crowd, such as leather, wood and plastic. Our technologies bring any pattern or vivid image to life – be this to serve as a textured background, or to impress your company’s logo. 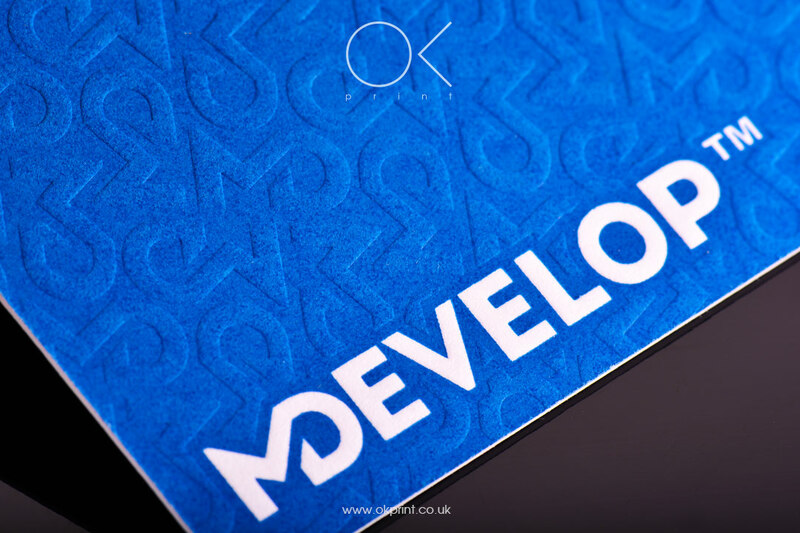 We’ll happily advise and guide you onto creating a completely bespoke, embossed business card that’s formed from the perfect combination of material choice, embossing effect, coloring and font style. for a beautiful first, and lasting, impression. 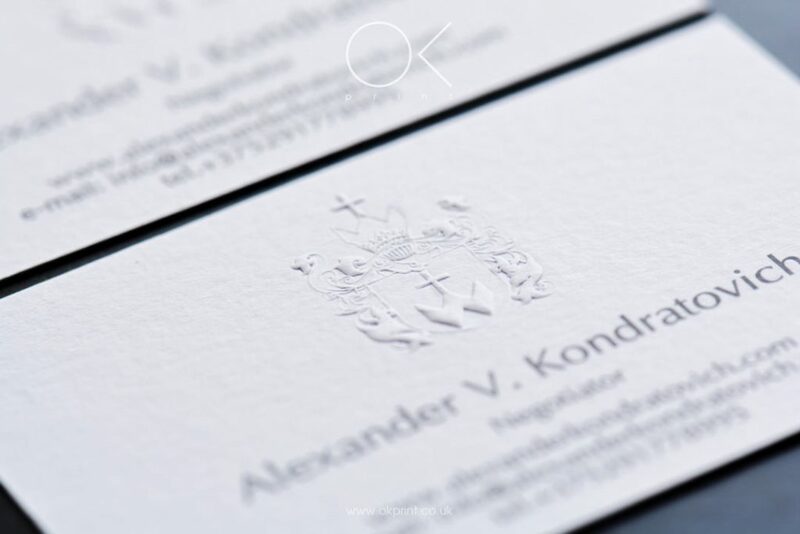 The embossing process is relatively simple and it enhances the look and feel of any business card. 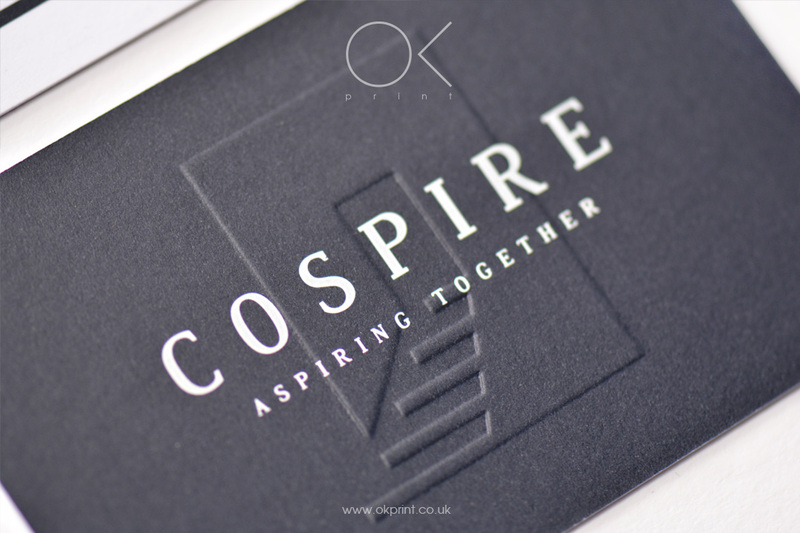 with a combination of our speciality range of design papers, the creative creation of the artwork as well as the embossing detailing, we can ensure that your business cards will be both premium and exclusive to you and your brand. Our designers will help you choose a unique optimal combination of those qualities that will help you identify and fully express yourself through your business cards. When designing business cards with embossing, some very important points must be taken into account. 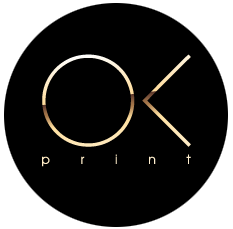 For example – the texture of the paper being printed on plays an important part in embossing, that is why OK PRINT! Offers an extensive catalogue of design papers. In our experience, long fibered, heavy sheets are usually the best type of paper to emboss on while heavily coated, lightweight or varnished paper prove problematic because of their tendency to crack easily when embossed. A general rule to remember is that the more a paper is processed, the less likely it is to withstand the pressures of embossing as the paper becomes weaker with each processing. Thick paper on the other hand allows the impression to push deeper into the paper and create a more dramatic embossing effect that allows different levels of relief to be possible. 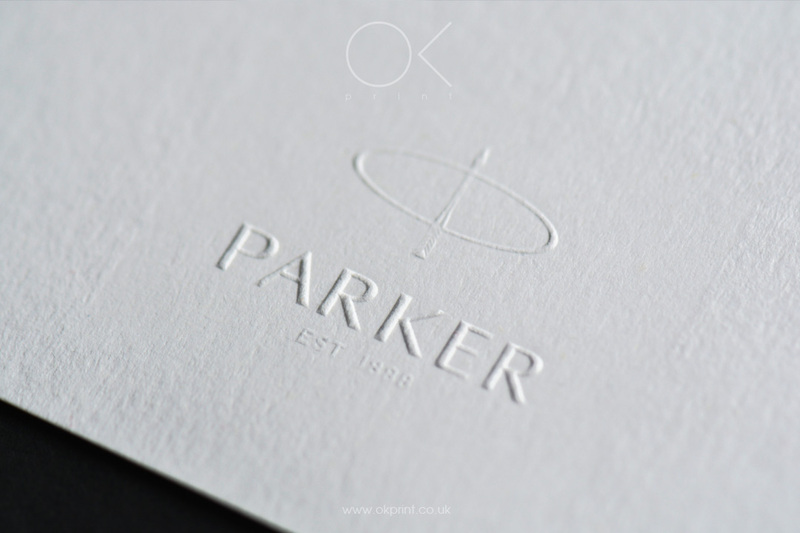 Original and memorable in equal measure, embossed business cards offer a tactile, textured alternative to the plain, flat and forgettable. 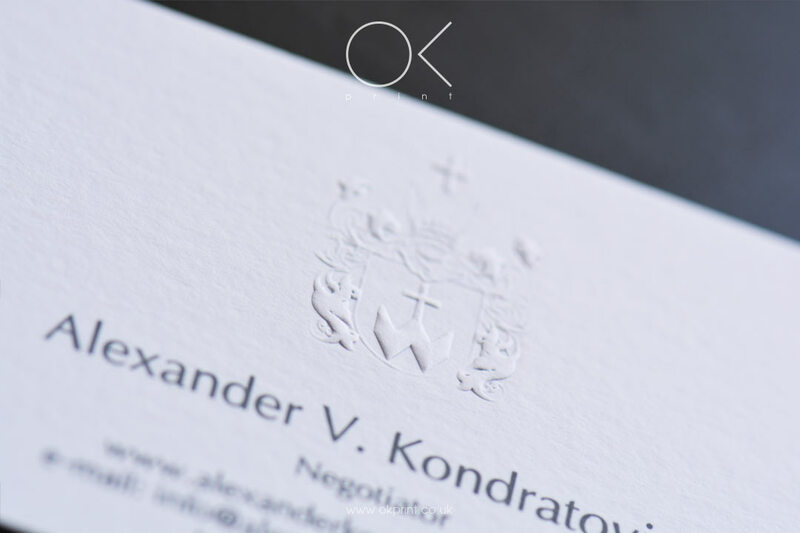 Ultimately embossed business cards are a staple addition to your branding, where the finest of products or services are given the representation they demand. • For a brand name that literally sparkles, couple foil embossing with a contrasting background. For a subtle, yet more textured and tactile effect, combine impressed debossing detail alongside raised embossing. • When choosing the embossing technique, we recommend limiting it to a one sided design as this will accommodate for the impression left on the opposite side by the embossing process. We are able to hide the effect of embossing on the opposite side of a design by individually duplexing. This is a very labour intensive work and as such commands a greater costing.